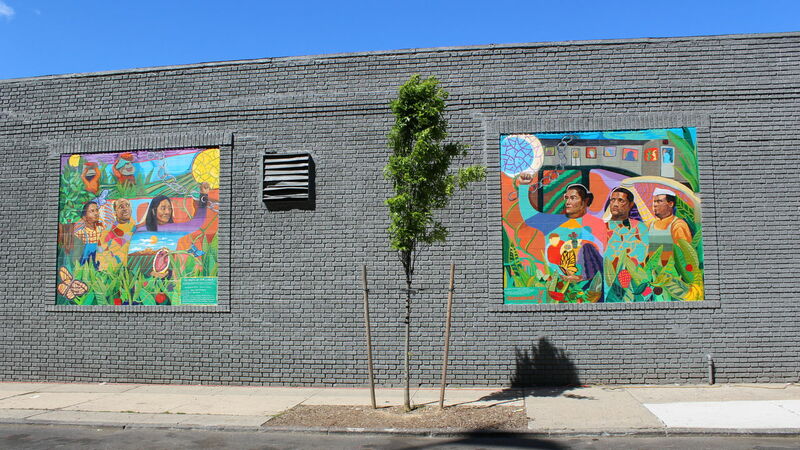 This mural was one of Groundswell's projects and was created by the young members of the Mount Eden community with artists Jose de Jesus Rodriquez and Paula Frisch. The project aimed to improve the public's perspective on agricultural and food workers, and highlights the vulnerability of these labourers. Organisers hoped to promote dialogue that considered negative aspects of the food chain and its effect on the community to inspire empathy and activism. Groundswell is an organisation based in New York City that brings together young people, artists, and community organisations to use art as a tool for social change. Founded in 1996 by a group of artists, educators, and activists, the organisation believes that collaborative art-making combines personal expression with the strength of community activism. Over the past 22 years, they have created over 500 murals throughout NYC. The collaborative process behind these artworks demonstrates their belief that art creates community and community creates change. Those who were included in the production of the mural include Jose Almonte, Saul Arias, Chantel Batista, Topaz Bowley, Rafael Cintron, Daniel Datix, Luisaira Duran, Kelanny Estevez, Sarafanta Kaba, Nicole Mera, Kenneth Navarro, Rodney Nelson, Emily Ortega, Stephanie Ortega, Aaron Osorio, Brian Perez, Charleny Reyes, Esmerelda Rivera, Juan Vasquez, Devon Veras, Haiman Sawadogo, John Hilario Torres, Justin Valdes, Keyla Ramirez and Pamela Zambrano. Community partners that were involved in the project were Communities for Healthy Food at Cypress Hills Local Development Corporation, LISC New York City, New Settlement Apartments and Comprehensive Model School Project 327. The project was funded by Laurie M. Tisch and Illumination Fund.